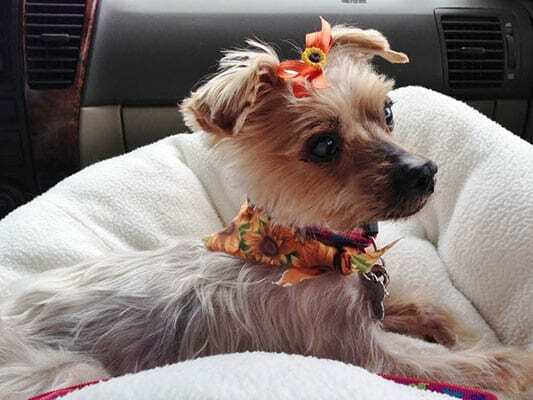 Mango, who is estimated to be about 9 years old, was a puppy mill dog before she came to the Blind Dog Rescue to be fostered in September 2014. She arrived at her BDRA foster home extremely thin with uncontrolled diabetes. It was soon discovered that in addition to the diabetes, Mango has a condition called Exocrine Pancreatic Insufficiency. This means she does not produce the enzymes that allow her to digest her food and that was why she was so thin – she would eat and the food would literally move right through her, out the other end! Once she started on pancreatic enzymes, she began to gain weight, and she now weighs about seven pounds. The enzymes must be added to everything she eats. It took Mango almost 8 months to get her diabetes under enough control to complete a spay but she continues to have other medical issues, so BDRA decided it would be best for Mango to live out her life in her BDRA foster home. Mango has bilateral cataracts, glaucoma, and dry eye. She has an unusual heart arrhythmia. She only has about ten teeth and they are in very poor shape. She has numerous mammary tumors. She has grade 3 luxating patellas and a joint problem in her front left leg, all of which cause her to have a wobbly, awkward gait. She is not able to climb steps and cannot walk very far. She is technically housetrained but, due to her diabetes which is not yet completely regulated, she will sometimes pee in the house at unpredictable times, so she wears a diaper during the day and uses pee pads at night. 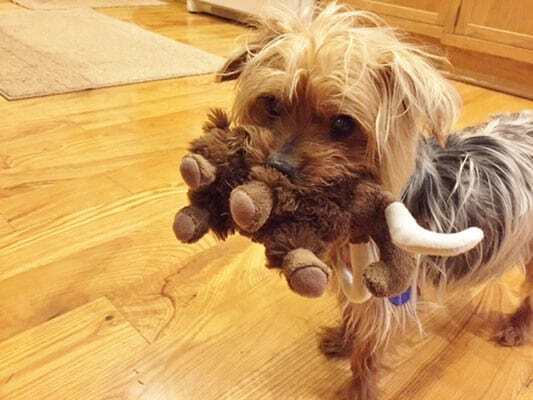 In spite of these many medical issues, there could not be a sweeter little dog than Mango. 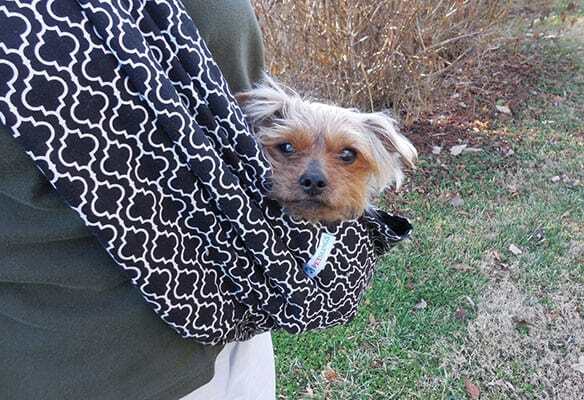 She loves nothing more than to nap in a lap or ride around the house in her Pet Sling. She likes the other dogs in the house and the cat too! She loves to eat but is on a strict prescription diet and can have only two meals a day with no treats. She enjoys stuffed toys and also sitting by the heat vent in the winter. Mango is a very expensive dog due to her insulin, blood glucose test strips, needles, lancets, prescription diet, pancreatic enzymes, glaucoma and dry eye medications, pain medication for her legs, pee pads, diapers, and vet visits, all of which total several hundred dollars a month. Mango would love to have sponsors help BDRA pay for her ongoing care! Mango is forever in our hearts. Mango is looking for her forever home. If you think it could be yours, read more about Adopting from BDRA before submitting your application below. BDRA relies on your donations to rescue blind dogs around the United States. Please consider giving in support of Mango.